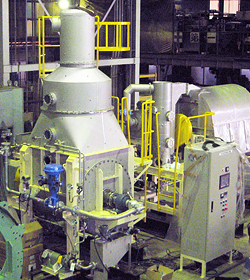 Coil Concentrator | KATSURAGI INDUSTORY CO.,LTD.- Dryers,Drum Flakers,Concentrators,Crystllizers. This is a rotary coil concentrator, in which coiled pipe is rotated in the concentration tank to send steam in the pipe. Generally, in the liquid concentration process, viscosity increases as concentration becomes higher, and scale adhesion on the heat-transfer surface causes a functional decline, which finally makes it impossible to continue operation. As a result, it is inevitable to stop operation to remove scale and clean the chamber. By rotating the coil formed based on the special knowhow, liquid of high density and high viscosity can be extremely smoothly concentrated without scaling. In addition, the coil concentrator shows its capability with extremely low-priced maintenance cost. Since the rotary coil serves as a heat-transfer surface, no clogging or scorching is caused by concentrated substances in the pipes. Firm scale is not caused by boiling without water or overheating, thus this concentrator can be operated continuously for a long period. It is not necessary to consider the generation of concentrates or decomposition products due to local heating or the accumulation of sludge generated at the liquid stagnant zone. It has excellent controllability as high-concentration production equipment to be operated continuously. It is suited to automation and enables labor saving and manufacturing of uniform products. It shows sufficient and stable capability with the half to one-fifth of the heat-transfer area of the conventional concentrators, thus it is significantly downsized and space-saving. It can be operated under both vacuum and atmospheric pressures and under temperature conditions suited for liquid properties, and thus deterioration and coloration of products can be restrained.